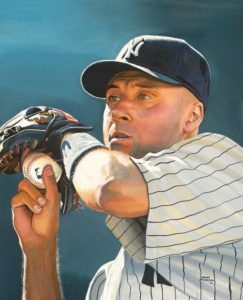 James Fiorentino has developed quite a following over the years from his amazing sports art as well as his nature art all done in his unique watercolor style. On December 15, 2017 from 6:00-9:00pm James will have a new art show called “The Baseball Watercolors of James Fiorentino” at Bergino Baseball Clubhouse Gallery at 67 East 11th Street-The landmark Cast Iron Building in NYC. 15% of all purchases will be donated to The Viscardi Center which educates , employs and empowers children and adults with disabilities. Represented by A Vision in Motion Speakers Bureau for speaking engagements, James Fiorentino speaks to children and adults of all ages. His past events have included: K-12 school assembly programs, parent workshops, career days, commencements, art shows, colleges and universities, organizations and corporations. His presentations include his amazing story of how his passion for sports and art led him to work with some of the greatest sports icons in the world today and to becoming the youngest artist to have his work displayed in the National Baseball Hall of Fame. James shares inspiring stories and some of his original art. He also has a power point slide show of not only his sports artwork, but his portraits and nature art. James talks about how art can help educate in preserving land and endangered species. All programs include a question and answer session. Book and poster signings following a program can be arranged. Sketch and watercolor demonstrations are available as well.